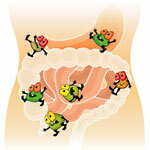 We all experience occasional indigestion -- bloating, abdominal pain, and irregularity. And while you may assume these symptoms are inevitable, they don't have to be. By supporting your gut, the digestive system can run smoothly and do what it was designed to. You'll not only experience fewer tummy troubles but also enjoy the benefits of improved immunity, a glowing complexion, and more. 1. Stay hydrated. Drink plenty of water to improve digestion. Water helps dissolve fats and soluble fiber, allowing them to pass through the digestive system more easily. Water also helps prevent constipation. You may have heard that drinking water after a meal may dilute digestive juices or interfere with digestion. According to the Mayo Clinic, this is not the case -- drinking water during or after a meal actually aids digestion. 2. Get plenty of exercise. Keeping your body moving benefits health in so many ways, and it also supports digestion. According to Harvard Medical School, aerobic exercise like a brisk walk helps stimulate the natural contraction of the intestinal muscles, keeping food moving through the digestive system. Regular exercise can also help you maintain a healthy weight, which is essential for digestive health. Although vigorous exercise isn't recommended after a large meal, a moderate walk after eating can help relieve bloating. 3. Bring on the fiber. Fiber keeps food moving through the digestive tract, making you less likely to get constipated. Slow digestion can also lead to gas and bloating. The body needs both soluble and insoluble fiber. Insoluble fiber, also known as roughage, passes through the digestive system in close to its original state, so it helps add bulk to stools and moves waste through the digestive system. Whole grains, seeds, nuts, celery, cabbage, and dark leafy vegetables are excellent sources. Soluble fiber draws in moisture and forms a gel-like substance. Good sources include oats, legumes, oranges, apples, and carrots. 4. Limit high-fat foods. In general, foods high in saturated fat slow digestion. Fatty cuts of meat can lead to digestive discomfort. Choose lean cuts, such as pork loin and skinless poultry. Also, pair foods high in fat with plenty of fiber to make them easier on your digestive system. 5. Take probiotics daily. Probiotics, or the healthy bacteria naturally present in the digestive tract, are critical for proper digestion and maintaining good health. Probiotics enhance nutrient absorption, strengthen the immune system, support healthy skin, and can even influence mental health, memory, weight, and the risk of chronic diseases. Researchers are investigating the link between gut bacteria and irritable bowel syndrome (IBS), Crohn's disease, learning disorders, autism, and more. Yogurt, miso, sauerkraut, kefir, and kombucha are natural sources of probiotics. In addition to incorporating these foods into your diet, probiotic supplements are an easy and convenient way to get a great dose of beneficial bacteria. Taking a daily probiotic supplement is one of the most important things you can do to support digestive health. Just be sure to read the label carefully -- some probiotic supplements need to be refrigerated, and failing to refrigerate them can diminish the healthy bacteria. Show your gut some love by incorporating these easy tips into your life today. Diet, regular exercise, and maintaining healthy gut bacteria are the keys to supporting healthy digestion. And improving digestive health is critical to overall wellness.